When it comes to dressing for any casual occasion, you cannot miss on this stylish belt brought to you by U.S. Polo. It has a perforated detailing all over, which lends it a classy appeal while the leather finish further enhances its overall appeal. Besides, it comes with a buckle closure that makes it convenient to wear. 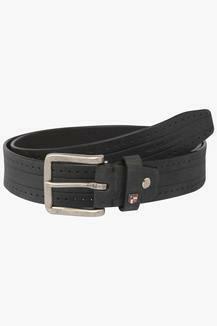 Complete your casual look by teaming this belt with jeans and loafers along with a shirt. Tailored with care using leather, it can be worn on a regular basis.